Videoarte del Mundo en Camagüey: Call for the entries to the 6th International Videoart Festival of Camagüey, to be held from March 31st to April 4th, 2015. 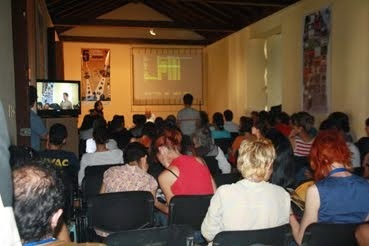 Call for the entries to the 6th International Videoart Festival of Camagüey, to be held from March 31st to April 4th, 2015. 1. Every artist or group of artists maysend up to 3 artworks to be approved by the Selection Committee appointed for the Festival. 2. Topics are free and the length of film is unlimited. 3. The artworks including those created using the new media- in order to be considered by the Selection Committee must be within the field of videocreation. 4. All artworks that are not in Spanish must be sent with subtitles in Spanish. 5. All artworks must have credits with the following data: title, author, and year of production. 6. The artworks will be presented in DVD disc in the following formats: mpg2 DVD (NTSC) or in Quicktime(H264) for a better resolution. · An Entry Form for each artworkfilled out and signed by the artist. 2. The deadline for the artworks reception will be January 9th, 2015.The artists must send the artworks by mail to the address provided at the end of the page; or provide the proper information to download it from the internet. 3. A Selection Committee involving experts of the Visual Arts will select the works that will take part at the festival. Their decision will be unappealable. 4. Artists will be notified of acceptance via email using the contact information in the entry form. 5. The entry fee is compulsory for all artists coming to the Festival. For national artists is 100 pesos (MN), and for foreign participants, 100.00 CUC. The entry fee will be paid on March 31st, 2015, at the Festival's official accreditation. 6. Other people willing to attend the festival must pay the fees previously mentioned. 1. The jury will grant the International Videoart Festival Award and as many honorable mentions as considered. 2. Different national and international institutions will also award by giving financial and technological support, and promotion. These awards will be given according to the jury and sponsors' criteria. 1. The Festival´s Organizing Committee reserves the right to invite national and international artists, curators, critics and experts that are considered of a special interest for the Festival. 2. All artworks in a digital format will become part of the Festival's archive and will be used in non-profit cultural presentations, and also as part of the itinerant version of the event. 3. All videos will be considered exhibition copies. It is recommended to obtain copyright in all cases.